There's been a lot of hot news around GPUs the past few months, making it an excellent time to be shopping for the best graphics card for PC gaming. Just yesterday, Nvidia launched drivers that would enable ray tracing support for it's GTX series of cards, which has expanded recently with the release of the GTX 1660 and 1660 Ti, GTX cards that pack the Turing architecture previously confined to the newer RTX series. On top of all this, rumor has it AMD is working on a new line of GPUs that will not only provide dedicated support for ray tracing, but will perform up to or even beyond the current capabilities of Nvidia's fastest cards. We fully understand if all this technical talk is making your head spin, so feel free to navigate over to our hardware glossary for a breakdown of why these terms are meaningful, or to figure out what the hell ray tracing actually is, take a peek at our explainer. Our choice for the best graphics card available looks much better at a sweet discount, especially when it's bundled with one of the few games to take advantage of ray tracing and Bioware's latest, Anthem. So there's a lot of competitive GPUs out there at the moment, which begs the question, how do you decide which is the best graphics card for you? First you need to decide how much you want to spend - if you blow a ton of cash on a video card and end up bankrupting the rest of your build it'll all be for naught, as you'll just run into bottlenecks elsewhere. But the GPU will always be the star of the show when it comes to building a gaming PC, so you should definitely prioritize it. It comes down to a matter of how much performance you need/crave - if you're looking to power 4K at reasonable frame rates and with the settings turned up, chances are you're going to need a high end RTX card, or at least something in the Radeon VII range. On the other hand, if you're satisfied with lower resolutions and want so save some money, your options are a lot broader, and include both GTX cards as well as AMD's 570 or 580 offerings. Of course, if you just want to skip ahead and get a complete system overhaul, head over to our best gaming PC roundup to get everything at once. Or if you need some shiny new peripherals to play around with your GPU, our best gaming keyboard and best gaming mouse roundups have you covered. The best card on the market now in terms of performance and price. While the 2080 is still an expensive proposition, the crypto-mining craze has abated somewhat and it's finally possible to find the Founders Edition at the listed MSRP, $799 (or cheaper). While the step-up version, the 2080 Ti, is more powerful, the additional $400 isn't worth it for a relatively marginal increase in computing power (between 10 and 30 percent), especially considering the relatively limited use cases for ray tracing that exist at the moment. While Battlefield V looks great with ray tracing enabled (and will reportedly perform 50% better after the recently announced patch), it's one of an extremely limited field of games currently taking advantage of the technology. 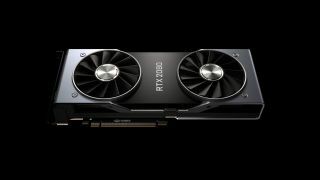 As more games that exploit ray tracing make their way into the wild and the Ti's price declines it may look like the stronger value proposition, but right now the 2080 is king of cards. If you're looking for a modern, entry level graphics card that provides reasonable performance at a sub $250 price point, the 1660 is the choice for you. Slotting into the space vacated by the GTX 1060, and providing something like 13-15% better performance at less cost, the 1660 takes advantage of the Turing architecture implemented in the RTX lineup but paired with the widely available (and thus inexpensive) GDDDR5 VRAM. The 1660 is clearly Nvidia's play to get into that golden market below $250 where, according to Steam Hardware Survey results, the vast majority of PC gamers shop. It's a mainstream play, perhaps aimed in part at mitigating the slower-than-expected sales of the 20-series family, but it delivers exactly what you expect at a price you can live with. AMD finally responded to Nvidia's high-end 20-series cards earlier this year in the shape of the Radeon VII, their most powerful consumer offering aimed at demanding gamers who are AMD diehards or remain skeptical of the ray tracing bandwagon. It's a great card that delivers extremely strong 1440p and reasonable 4k Ultra performance, and the first ever GPU manufactured with 7nm lithography. It's a powerful card at a reasonable price and, if you want a top shelf AMD card or favor their HMB2 memory solution, it's really your only choice. A good thing, then, that they've delivered a competitive card. It's roughly analogous to the RTX 2080 in terms of horsepower and retails for a $100 less, though it doesn't come with any of Nvidia's much vaunted RT or Tensor cores for ray tracing and DLSS. If those aren't features that entice, however, the Radeon VII is a great alternative to Nvidia's growing stable. The 1070 Ti, another iteration on the now prolific Pascal, is one of the best mid-range cards on the market. If you’re looking for a card to power games at 1440p resolution and that can easily handle VR, and aren’t looking for the blistering performance of cards hundreds of dollars more expensive, the 1070 Ti admirably balances performance and cost. Approaching the performance levels of the base 1080 for significantly less cost, the 1070 Ti is a granular answer to the challenge of AMD’s Vega line. If you want killer performance but aren't ready to upgrade to something in the 20-series family, the 1070 Ti is a great upgrade option that will save you a few bucks, at least until Nvidia starts to properly phase them out. If you have yet to make the leap to a 4K display, spending a tremendous amount of money on an overpowered GPU may seem like an act of excessive decadence. While you’re saving cash for a new 4K monitor/panel, the $200 the 580 shaves off the price of the next tier of cards is very significant, and AMD’s budget option can easily cope with the tail of the 1080p era. For the budget conscious and anyone looking to ensure your PC is keeping pace with current generation consoles, the 580 is a great solution. And its 8GBs of GDDR5 is generous in comparison to Nvidia’s similarly priced 1060 line, overhead that will be greatly appreciated as rendering demands continue to escalate. Nvidia's latest release in its RTX line, the 2060, is the cheapest way to prepare your rig for our ray tracing, DLSS enabled future. As well as packing Nvidia's much touted new features, the 2060 outperforms the card it's meant to replace, the 1070. It gets you everything packed into the 2070's stable, just slightly less of each, but if you're looking to grab a card to handle 1080p and 1440p gaming the 2060 is the least expensive way to get onboard the ray tracing bandwagon. If you've already got something in the 1070 range, the jump to the 2060 might seem premature, especially around launch when they'll be hovering near full price. But if you're looking to step up from a 970 or lower card, the 2060 is your best bet for great performance that will, to some extent, future proof your setup for the inevitable proliferation of DXR.